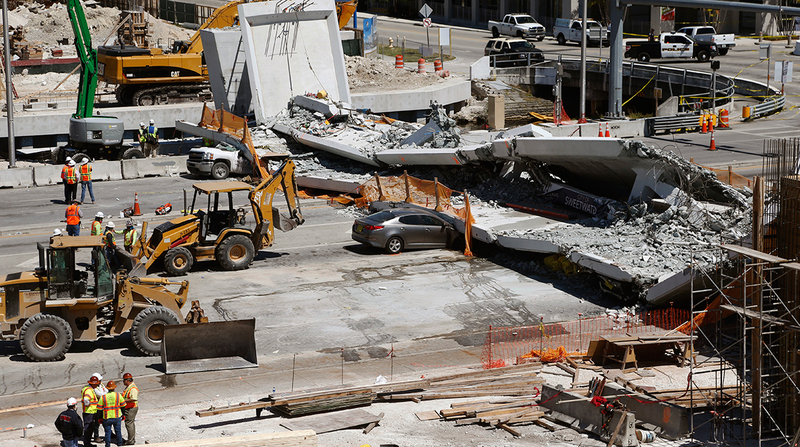 The pedestrian bridge near Florida International University collapsed March 15, just days after it was installed. Six people were killed. ABC streamlines the building process in an effort to reduce construction time, traffic disruption and costs. According to the Federal Highway Administration, ABC methods produce more durable bridges with longer service lives than conventional bridges and allow replacement within 48 to 72 hours rather than years. There are more than 600,000 bridges in the country, according to government statistics. Anil Agrawal, a member of the American Society of Civil Engineers, estimates between 5% and 10% are built with ABC methods. Agrawal said ABC methods will only grow in popularity because they create less disruption in urban areas. One of those methods commonly used is prefabricated construction, whereby structural components of a bridge are built elsewhere and include features that reduce the on-site construction time. “ABC will continue to be popular because we don’t have a choice,” Agrawal said, adding that prefabrication is especially useful in cities because it poses a relatively small threat to congestion. For example, a complete bridge closure in a place such as New York City creates a “nightmare,” particularly for truckers making deliveries. “We cannot afford to close bridges,” Agrawal said. Scott Roux, national bridge practice lead for Michael Baker International, agreed, citing the value of efficient construction and rehabilitation projects in urban areas. Michael Baker International offers engineering and consulting services. The tallest bridge in the world, France’s Millau Viaduct, was built using ABC methods, according to Roux. This cable-stayed bridge carries regular traffic, including trucks. Roux said ABC technologies are prevalent overseas, and have gained popularity in the United States over the past 20 years. “Don’t expect it to diminish. It’s too valuable a tool, and it’s becoming too necessary in congested and urban areas,” Roux said. Mike Arens, also at Michael Baker International in the Salt Lake City outpost, said the older practice of shutting down a road, setting girders and pouring concrete for the bridge deck on top of beams has too great an impact. Doug Hecox, spokesman for FHWA, said it will assist the National Transportation Safety Board in its analysis of what caused the pedestrian bridge in Miami to collapse. The agency is not willing to discount the entire ABC process because of this accident, he said. Wassim Ghannoum, associate professor of civil engineering at the University of Texas at San Antonio, said the results of NTSB’s investigation may or may not slow the momentum of ABC.